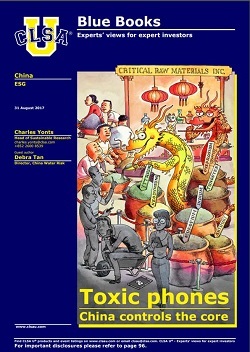 31 August 2017 – CLSA issues report titled “Toxic phones: China controls the core”. China Water Risk guest authors this report for CLSA U®, which highlights the risks associated with the highly polluting rare earths and other critical raw materials (CRM) lying at the heart of our phones’ interactive core. Imagine your iPhone or Android without a touchscreen. Imagine playing Pokemon Go, Angry Birds, Candy Crush or Tinder without swiping right. The report warns that trillions of dollars could be at risk if there is a bottleneck in the supply of CRMs and explores in depth the shaky foundations that underpin this house of cards. Also see how household smartphone brands like Apple, Samsung, Huawei, Nokia or LG are faring. Of the 70+ elements found in a phone, at least 14 are key to the interactive core; 9 of these are rare earths but almost all are considered critical by the EU Commission because risks of their supply shortage & their impacts are higher. In addition, China is running out of proven reserves and is looking for more at home & abroad and there are hard caps on tungsten and rare earth production. China’s rare earth imports have increased 11.6x since 2012 and we project the ex-China demand gap can be as much as 70,000 tonnes by 2020. It is unclear who will supply the rest of the world given that China is also securing reserves by stepping up acquisitions of global sources. The report warns that as China says no to pollution and yes to a high tech future, transitional risks are abound. These can have profound impacts across industries. Smartphone brands’ current no-sense strategies from low recycling rates, built-in obsolescence and poor repairability only serve to compound these risks. According to the report, a convergence of risks is hidden in plain sight. China is gearing up to be “future ready” by securing CRM supplies, building a circular economy and cleaning up pollution. Are you? Get on top of these issues with this report. Click here to access the report. Please note that the report is accessible to professional investors only. We shall however review the report in our newsletter next month… sign up now!